I’m in my hometown near Detroit. The boats are on the water, kids are in bathing suits at every lake, and my family is near. With a Ford in the driveway here, and a Chysler parked in front of my California home, there is nothing I’d like to see more than this city and state revived. Energy policies, economic incentives. 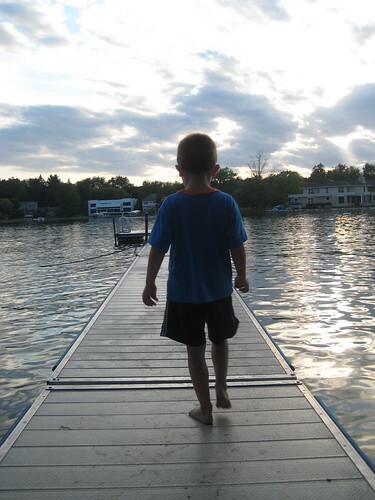 They don’t seem to matter much when you’re helping your sure-of-foot 5-year old down his first wobbly, Michigan dock. I miss this town. I’m still proud of this town. I’m listening to my mother and my brother discuss my daughter, and I can’t decide if I am thrilled or offended. I just kept on slicing eggplant at the counter while they went on and on and on. Needless to say the past few days with my 3-year old have been…let’s call them trying. I’ve written about this before.Oh yeah and here. Oh…here too. And about 20 other times. 3 is worse than 2. As I type this. our darling daughter is being sassy to her grandfather who made the mistake of trying to help her go potty. I DO IT MYSELF GRAMPS! And my Mom and brother are snickering from the couch and mentally pointing and laughing in my direction. Everyone seems to be finding my ANGEL’s temper HILARIOUS. The subject of very genuine belly laughs. 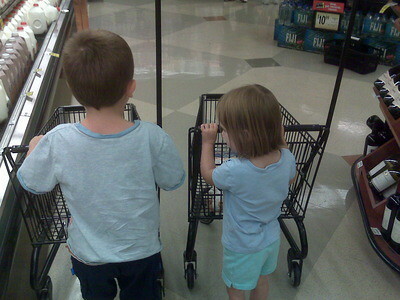 She might be more vocal than her brother before her…but no more difficult. She’s certainly got more flair than her sibling…drama, shall we say…but no more difficult. She is three. And three is killing me. I wrote the book on difficult. The student must learn to respect the master. The student needs to acknowledge the master. The student still has a lot to learn about sass and manipulation. If nothing else, Little Miss 3 needs a wait a few years before thinking she can take over the throne. I’m at BlogHer ’08 in San Francisco. But I wanted to quickly introduce you to BlogHer’s newest blogger. We’re ramping up for BlogHer! Yes, it’s Cannonball Run, 2.0 style with Sarah, Devra, and Meagan joining me live TONIGHT on Ustream. I fully expect silly to occur. We might actually talk about important things too. Like how your mom probably never did a sponsored road trip with wifi in the car, while webchatting with friends and twittering. They are without their kids, making their way to San Francisco in a hybrid. They’ve already invoked the Blues Brothers. This is going to be fun. 8pm Pacific. Don’t miss it. Barack Obama is 100% Pro-Choice. Period. PunditMom is considering NOT voting, Cynematic has warning bells blazing, Gloria Feldt is closing her wallet, and AnnRose is recounting her days at a hospital specializing in late abortion. This has too many women wondering. I am not comfortable wondering, and I have no intention of wondering my way to November. I talked with Pam Sutherland today, President and CEO of the Illinois Planned Parenthood Council. We each had one thing on our minds and we both understood it’s importance. There was no small talk. There was no chit-chat. This conversation was arranged knowing what was at stake. She knew what she needed to say, and I knew what I hoped to hear. And now I get to tell you. Pam Sutherland does NOT have ONE doubt in her mind that Senator Barack Obama is anything but 100% pro-choice. I happened to be talking to Pam as I watched Senator John McCain seemingly writhe in pain when asked his position on forcing health insurance companies to cover birth control. Did you catch the difference there? McCain entirely uncomfy on YouTube, Obama talking TO US. I also talked with the Obama campaign, hoping to clarify the Senator’s remarks that had pro-choice women wringing their hands. That didn’t clear things up for me. I continued my call with Pam and really tried to get to the heart of this. Senator John McCain has received a 0% pro-choice rating from Planned Parenthood and NARAL Pro-Choice America. Senator Obama received a 100% pro-choice vote rating from Planned Parenthood and NARAL Pro-Choice America. Can I also point out McCain co-sponsored and voted for the Federal Abortion Ban? Yea, he did. Senator McCain voted against legislation that established criminal and civil penalties for those who use threats and violence to keep women from gaining access to reproductive health facilities. The record by both candidates goes on and on and on. It’s not even a contest. Liza at Culture Kitchen even has a graphic demonstrating the difference. If Planned Parenthood and NARAL are confident in Senator Obama, why aren’t you? Pam Sutherland isn’t worried, and I’m not either. My brain still fuzzy after the 4th’s fireworks and libations, I had to rub my eyes and go get my glasses upon reading this morning’s headlines. Then I had to clear the cobwebs from my brain and process what was being said before I cried into my Women for Obama t-shirt. oh holy hell, is he pandering to the right with this crap? are you kidding me? why would he even talk about limits and and definitions when the women’s vote is being so heavily courted by Senator McCain…is he talking about limits on just late term or could this carry over into ‘mental distress’ in any termination of pregnancy and what exactly qualifies as ‘mental distress’ and who gets to decide and why is the government even INVOLVED in this and why on earth wold he say some like that to a Christian magazine and would he have said the same to planned parenthood and what in the hell is going on with my candidate because I realize this whole ‘move to the center’ thing is really just people educating themselves on where he has ALWAYS stood but has he always stood against mental distress/late term abortion stuff….crap I need coffee. I then hinted to fellow Huffington Post contributor Lee Stranahan that he was welcome to drive the extra 20 minutes to deliver me a latte, since he was already out getting one for his wife. Lee politely mentioned something about gas prices and I begrudgingly made myself a pot. I’m now two cups in and ready to break this down a bit so no one gets hysterical and suffers the same caffeine-free heart failure I did a few hours ago. If Obama acts on his position, he’d be going against NARAL and other pro-choice entities. Which I HOPE means he’s not going to push that provision because it would undermine. We will need clarification on that before we all go crazy here. I’ll be the first to admit late-term abortion is where my very staunch support of all reproductive rights gets clouded. It’s uncomfortable to think about, to grapple with, to imagine. However I always default to the position of NOT knowing every woman’s situation. We also know our right to control our own reproduction is constantly under attack. The anti-choice movement takes every inch they can get on any issue on the table to tries and ‘undermine’ current laws and legislation. The issues are varied and the debate is large and overwhelming. Even in my own family, the discussion and debate causes problems. My husband and I disagree over parental consent and continue to go around-and-around on the topic. I respect my husband’s opinion, but I think he’s wrong. I respect Senator Obama’s opinion, but I think he’s wrong. I still married my husband, and we continue to debate the issue. I’m still voting for Obama, and expect we will continue to debate the issue. Maybe voting is a bit like marriage. My husband has core values that I agree with and we compromise and fight and respect each other on some of the details. Senator Obama has a core values that I agree with…I’m guessing between FISA and this, the compromise and fight and respect on those details will also emerge. So long as those core values remain, I’m guessing we can stay out of divorce proceedings. So long as those core values remain, I’m guessing we can stay out of third-party candidate, write-in vote proceedings. The Senator, like my husband, remains the best person for the job. Although I wish they were both a bit more like Mrs. Stranahan’s husband and would bring me some coffee. 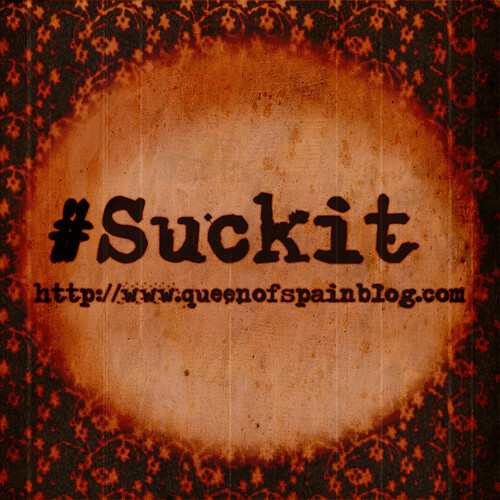 Erin Kotecki Vest is Political Director at BlogHer.com and thinks she’s Queen of the World on her own blog Queen of Spain blog. She also contributes over at MOMocrats where even her non-coffee bringing husband has guest posted so the entire family can Rage Against the McCain.